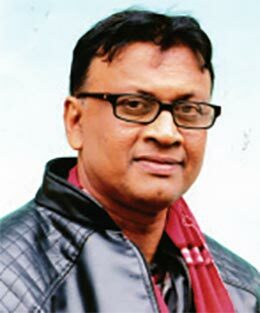 Playwright and Stage Director Saponjyoti Thakur belonging to Dergaon in Golaghat district was honoured with the Swabhav Shilpi Amulya Kakati Memorial Award 2018. He was presented with the award for his contribution towards promoting and preserving the cultural heritage of the state through his work. The award ceremony was held on February 9, at the Vivekananda Kendra auditorium in Guwahati. The award which is initiated by the Students’-Artists’-Litterateurs’ Welfare Trust of the All Guwahati Students Union is constituted to withhold the legacy of eminent actor, director, producer, scriptwriter and playwright Amulya Kakati. A memento sculpted by eminent sculptor Biren Singha, gamosa, cheleng sador and an eri jacket was given to Saponjyoti Thakur along with Rs 25,000 cash. Noted Assamese actor Mirel Quddus handed over the award to Thakur. Thakur credited the involvement of common people in his ventures as his greatest achievement and also added that his work is dedicated towards the betterment of the community, in a speech. Thakur can be credited with the immense success of the amateur theatre movement which he took to different corners of the state. His promotion of the one-of –a-kind initiative of ‘courtyard theatre’ takes various art forms to the grass root levels. Apart from his contribution to the amateur theatre movement in Assam, more than 30 of his plays have been aired by All India Radio’s Guwahati, Dibrugarh and Jorhat Stations.